Product prices and availability are accurate as of 2018-09-11 13:51:07 BST and are subject to change. Any price and availability information displayed on http://www.amazon.co.uk/ at the time of purchase will apply to the purchase of this product. 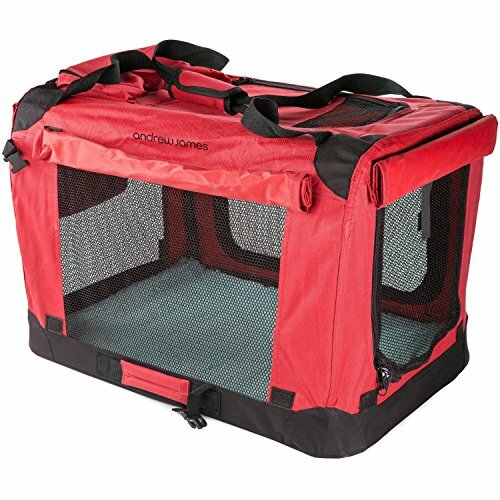 Our Cosy Pet Carrier provides a safe and comfortable way to transport dogs, cats and other small animals. Ideal for trips away, car journeys and visits to the vets, it can also be used in the home simply as a bed or puppy training crate. A cosy fleece bed means pets can make themselves at home and have a more comfortable journey, and mesh walls on all four sides provide good ventilation and allow pets to see out. Alternatively, privacy shutters can be rolled down on all sides, which can help to calm nervous animals. The carrier has a sturdy construction with a tubular steel frame that allows the crate to be assembled or collapsed in just seconds. The 49.5cm x 34.5cm 35cm carrier folds to a compact 10cm in height for easy storage and transportation. It is possible to carry an animal up to 15lbs/6.8kg in weight using the handles provided. There are three zipped openings for convenience, and these can be secured with the included carabiners to prevent 'Houdini' pets from escaping. Also included is a handy pocket and a detachable storage bag, so you can keep your furry friend's treats and accessories organised when travelling.